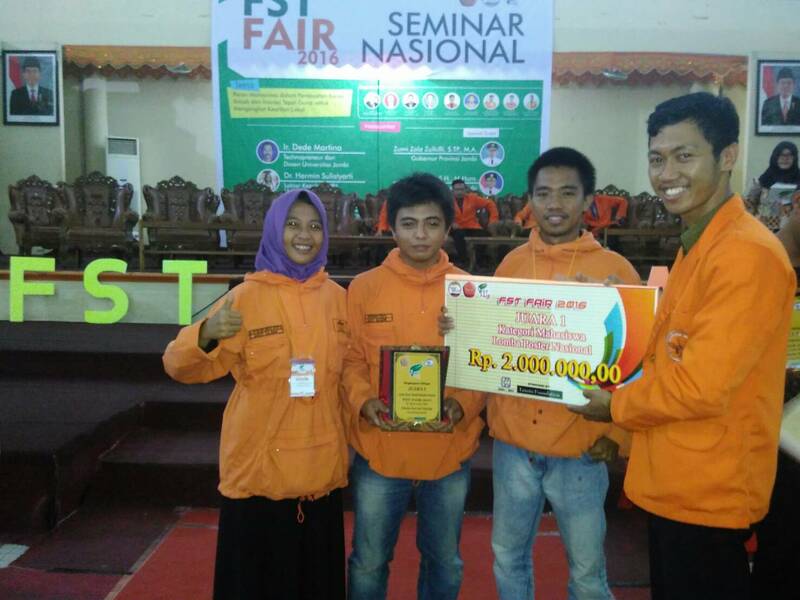 Delegates from the Geology Engineering Universitas Hasanuddin attained the first position winner of a poster competition in the Science and Technology Festival 2015, conducted by Universitas Jambi, Saturday (26/11). Out of the 21 registered teams, the team of Sudirman, Siti Waiyah, and Anugrah Syafi’I (2014 batch) was able to be in the top five position along with other reputable Universities, including Universitas Indonesia, Universitas Gadjah Mada, Universitas Sriwijaya, and Universitas Pembangunan Nasional “Veteran” Yogyakarta. The five teams were invited to present their posters and take participation on all events during the dates from 24-27 November 2016. Head of the Geology Student Executive Board Universitas Hasanuddin highly appreciated their achievement, and thanked all elements that supported their fellow members in attaining the position. The individual familiarly known as ‘Jenderal’ hoped that in the future, members of HMG FT-UH are able to attain achievements in other competitions, and be financially supported by the University. The Head of Geology Department, Dr. Eng. Asri Jaya, ST., MT, also expressed happiness and appreciation. “Events of HMG is committed to be align with the conducts of organization and the academic environment and demands of the Geology Department, and that has happened with hard work and innovative thoughts,” stated Asri Jaya. He further elaborated that the students have for a number of times, represented well the institution, therefore the Heads of the University must appreciate such works. Such an achievement further proves that from the aspect of student achievements in the accreditation point that all are true, considering that the Geology Department recently attained an accreditation of “A” from BAN-PT (1631/SK/BAN-PT/Akred/S/VII/2016), and as of now, prepared for the ASEAN University Network accreditation.